People join Outset’s enterprise workshops with a huge range of ideas, but not always with a clear understanding of how to turn their idea into a trading business. Fortunately, Outset’s advisors are always able to make recommendations to help ensure that the new business starts up smoothly and successfully. Elaine Edwards returned to the UK last year after living in Portugal for 14 years, and found inspiration for her new business venture from her son Michael’s vegan lifestyle. 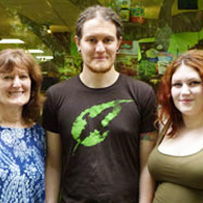 Michael had found difficulties in finding genuinely eco-friendly products in Plymouth, so the pair decided to open their own shop selling ethical goods. Elaine had run businesses in the past, but she and Michael were daunted by the prospect of opening up a city centre shop, so they turned to Outset Plymouth for help, having been recommended by friends who had already benefited from Outset’s Plymouth service. After finishing the course, Elaine and Michael worked on their business plan, then brought in Michael’s partner Amelia Greenwood to help with researching and buying the product range for their shop, Ethica. Having set up shop in the centre of Plymouth, Elaine and Michael are now concentrating on growing their client base. In the future, they’re also hoping to expand their offering through an online shop and increased product range. And while they’re excited to see their new business up and running, Elaine and Michael agree they would never have got started without Outset’s help.